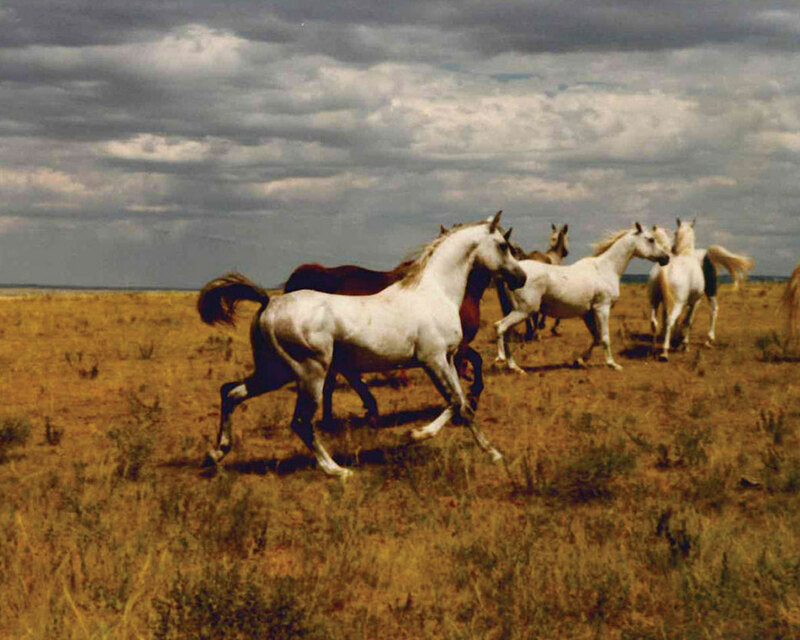 Dr. Karlan Downing’s six-year-old stallion KMA Pacino out with his mares. Dr. Karlan Downing was influenced by Dr. Bill Munson’s pasture breeding philosophy followed on his famed Shalimar Ranch, in Nebraska. He had several stallions that were all turned out together during the winter, and then in the breeding season, each stallion was turned out with his own group of mares. Here are two groups of Shalimar mares, each with their own stallion. The images were provided by Bill’s grandson, Adam Edmund, who carries on the program today. Birds do it, bees do it, even horses under trees do it! However, like everything in our fast paced world, technology has changed how we breed our horses. A lot. 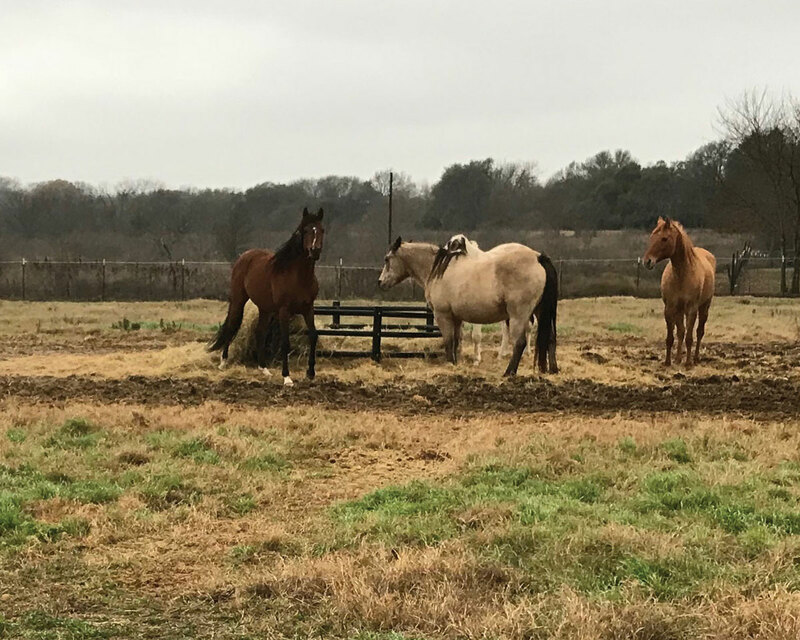 That is why it was so refreshing to see the recent video posted by Dr. Karlan Downing of her six-year-old stallion KMA Pacino (Los Angeles x KMA Spanish Sonata) being turned out with a group of older mares. (See the video on our website.) Pacino proceeded to “circle up” his ladies, even though he had never been out with mares before. 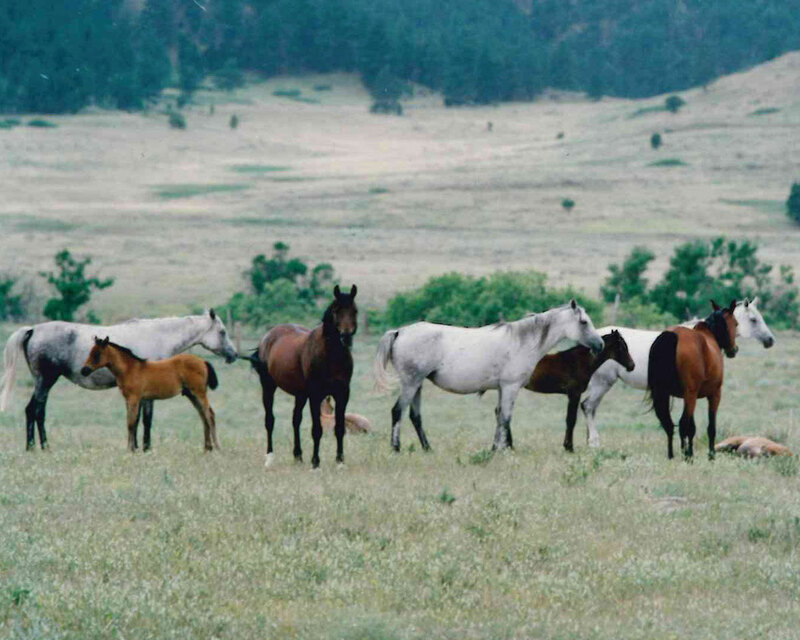 There must be an innate switch that goes on when a breeding stallion has a group of mares. Whether he is a wild horse accustomed to gathering his mares over time and through many fights or was simply “presented” with a herd such as the one at Karlan’s farm. It is all a part of Karlan’s approach to pasture breeding her mares. Those of us “of a certain age” grew up in the days before ultrasound machines, artificial insemination, embryo transfer and all of the other “modern” technologies. We hand bred our mares or pasture bred them and amazingly, the mares got pregnant and the stallions survived! Somewhere along the way, we separated the mare and the stallion from the breeding process and inserted veterinarians, artificial insemination and other techniques in the middle. Was it really progress? Dr. Downing doesn’t think so, and we asked her to elaborate. “I was mentored by Dr. Bill Munson, and I remember a time when he had several stallions that were all turned out together during the winter, and then in the breeding season, each stallion had his own group of mares that he was turned out with. He would pasture breed his horses and I eventually did the same. Although we can and do breed via artificial insemination and do embryo transfer at our farm, I am a firm believer in allowing horses to pasture breed for a number of reasons. Of course as soon as I tell someone I’m turning out one of my halter-winning horses to breed mares they freak out. The first thing they say is, ‘How can you do that? Your stallion is going to get injured!’ My response is — if he is stupid enough to get hurt by the mares, then he doesn’t deserve to be a breeding stallion! “I am very careful about how I introduce the stallions and mares and that is the key to a successful pasture breeding program. First of all, I never put a stallion out with mares unless he has been bred in hand first. When I hand breed a stallion for the first time, I let him cover the mare, and then we just stand there until he is ready to cover the mare again. And I let him cover the mare again. Then we stand there until he is ready to cover the mare again, and he covers the mare again. The reason for that is that he learns not to rush mares — he understands he is going to breed the mare again. It is also important the first time you hand breed a stallion to use a really sweet mare that will stand well and not cause any problems. “The only time this didn’t work for me was when I had a stallion that was fairly pushy. Even though I had hand bred him several times, he was still dragging me to the mare (while waiting in-between covers). So I put him out in a group of mares. He was very cocky and rushed up to a mare and struck out at her. She turned and kicked out at him with both hind legs, and then ran backward about 40-50 feet, kicking at him the whole time. When she got tired, three other mares started chasing him around the field. The next morning, he was a very humble stallion! “This brings up several other important points regarding pasture breeding,” continues Karlan. “You must have a pasture with a good fence. You must also have a pasture with enough room so the stallion can get away from the mares if necessary. Mares are great for putting manners on a stallion. They do a much better job of teaching a stallion manners than people do! Young, obnoxious stallions that are put in a pasture breeding situation come out at the end of the summer with perfect breeding manners and they never forget. 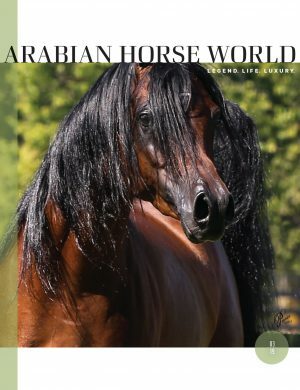 “It is also important to know your mare herd dynamics before introducing the stallion to the mix. First of all, don’t put the stallion out when a mare is in heat. Wait until the mare has gone out of heat before putting the stallion in. Let the mares sort out their pecking order before you put the stallion in with them. If they still haven’t sorted that out and you put the stallion in, he will get caught in the middle.” We asked Karlan what she does about maiden mares. “Maiden mares do fine in a pasture situation,” she replied. “Don’t put her out there when she is in heat, however. But if the stallion has pasture bred before and knows his job, he will spend a lot of time with her when she does start to come into heat. He will ‘court’ her, if you will. So by the time he actually covers her, she isn’t scared and does just fine. “Pasture breeding is also sometimes the only way to get older mares in foal. Older mares tend to get pregnant later in the year, in autumn and winter. Often people breed older mares early on, and they don’t get pregnant and are labeled ‘problem’ mares. I’ve had many, many ‘problem’ mares that were put out with a stallion later in the year and by winter were in foal. In fact, I had a mare that I never saw come into heat. I never saw the stallion cover her. So I was sure that she was a true problem mare. When the vet came to check her at the end of the season, he just laughed. ‘You’ll never get her in foal,’ he said, ‘because she’s already three months pregnant.’ That said, older mares with endocrine problems or age related problems are not necessarily good candidates for pasture breeding. 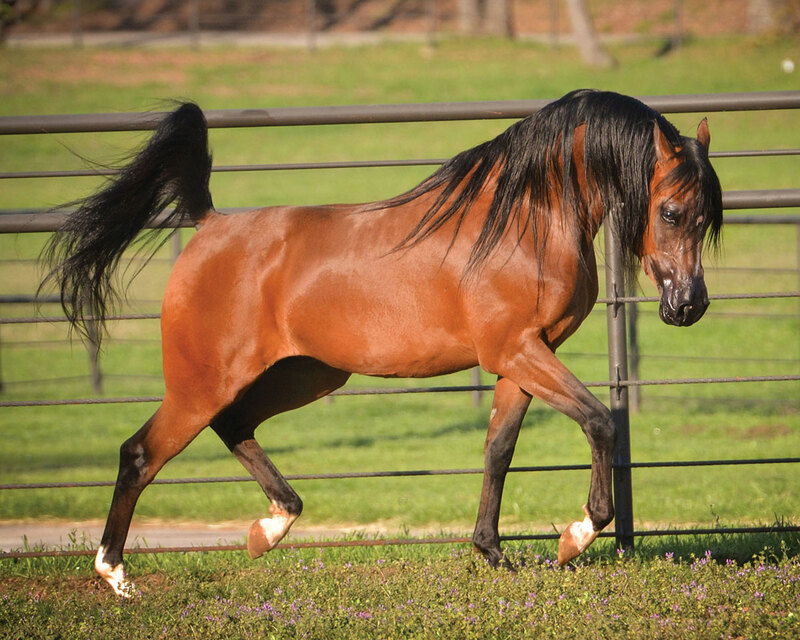 Karlan shared with us the top three advantages of pasture breeding stallions. “It works. It works. It works.” But in all seriousness, she amended that to the following: “It is very effective at getting mares pregnant, especially older or ‘problem’ mares. It is cost effective for mare owners. It is cost effective in man hours. You get mares pregnant without complications — every time a vet sticks his arm in a mare there can be complications. As a doctor, we often say, ‘Just because you can do something to a patient doesn’t mean you ought to do something.” The top disadvantage is not injury to the stallion. “I won’t say they never can be injured, but if done correctly, it very rarely happens,” she was quick to say. “You need a good fence. You need to be careful because sometimes the stallion gets possessive of the mares and won’t let you take one out. So you need to catch the stallion routinely and take a mare out and put her back just so he understands that you can take a mare out and also reinforcing that you can catch the stallion. You must understand mare herd dynamics. Also, just like there are some mares that may not do well in a pasture breeding situation for behavior or medical reasons, the same applies to stallions. There may be the occasional stallion that has a behavior problem that makes it unsafe for him to be turned out with mares. Also, if the stallion has physical problems that would make it difficult for him to breed naturally, then certainly there are other options with many of the modern technologies. Dr. Downing must be doing something right. Her horses over the years have won Regional and National honors in many disciplines from sport horse to trail, and hunter to halter. Dr. Karlan Downing is the owner of Karma Arabians and has been breeding winning purebred and Half-Arabians for over 40 years.